Levator Scapulae Syndrome is an historical name for "pain over the upper medial angle of the scapula" (LoE 3B) that is still used in clinical practice in some places around the world. This terminology (and use of the word syndrome) describes a set of signs and symptoms that often present together without identifying the cause of the pain and dysfunction, as is the case with other syndromes such as chronic fatigue syndrome and irritable bowel syndrome. It is widely considered better practice to use more specific terminology that refers to relevant causative factors that can be addressed during treatment. The levator scapulae muscle extends from C1-4 to the medial aspect of the scapula, between the superior angle and the root of the spine. Its function is to assist with various neck, arm and shoulder movements such as shoulder elevation and cervical side flexion. Often this muscle can become tense and painful leading to reduced motion in the area. There is evidence of an association between mechanical neck pain (MNP) and dysfunction of the muscles of the cervical spine (LoE 5). The dominant shoulder is most commonly involved (82%) and pain radiates to the neck and shoulder, but rarely to the arm (LoE 3B). 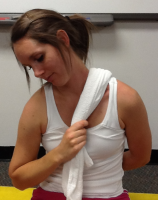 Altered shoulder biomechanics or poor posture. Repetitive arm motions such as in swimming, throwing, or racquet sports. Carrying bags with straps over the shoulder. Stress / anxiety, many people who experience the effects of these trigger points also complain of a shortness of breath (similar to that associated with panic attacks). Neck pain, which may extend to the head causing a headache. Pain and restricted range of movement, especially reduced cervical flexion and side flexion to the contralateral side. Deep, achy pain and/or tightness on the upper back along the top of the shoulder blade or neck. The Levator Scapulae can present with two trigger points located in the lower half of the muscle. The lower trigger point lies just above the superior angle of the scapula and upper trigger point lies 1-3 inches above the lower trigger point. Both trigger points lie deep to the upper trapezius muscle. 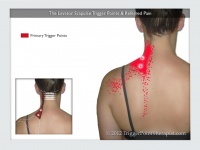 Both trigger points refer pain laterally to the shoulder and along the medial aspect of the shoulder blade. With this presentation of pain and trigger points in the region of the levator scapulae it is important to complete a full assessment of the cervical spine as pain in this region is often referred from the cervical spine. The presenting pain is likely to be reproduced on active and passive range of movement testing of the cervical spine especially flexion and side flexion to the contralateral side. The muscle is also likely to be tender on palpation and may present with increased tone, especially in the region of the trigger points. You must also rule out the thoracic spine and shoulder. The phenomenon of levator scapulae pain of cervical origin being reproduced on shoulder movement has long been clinically recognised(LoE 3A). Primary treatment with be aimed at the dysfunction that you hypothesise to be causing the levator scapulae dysfunction i.e. the cervical spine. Muscle strengthening exercises of the Levator Scapulae are also beneficial to correct and prevent any disbalance in the neck  (LoE 2B) (Upper crossed syndrome) which is correlated to bad posture and tension in the muscles.